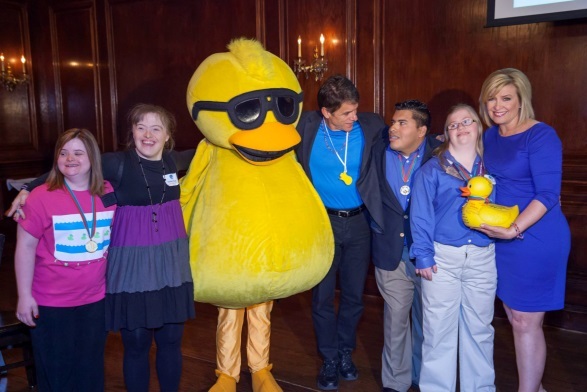 Katelyn Gruenwald of Palatine was chosen as the Duck Ambassador for this year’s race. She is currently the top seller on the team. Our Darling Ducklings are a competitive bunch. Sales have been set up at Area events and numerous places of business such as Family Video, K&M Printing, Walgreens, Baxter and Northshore Hospital. Moms, dads, siblings, aunts and uncles have all bought into their athlete’s goal and are doing what they can to make additional sales for the team. At this year’s Duck Race Kick-Off event at Maggiano’s of Chicago, emcee Allison Rosati was presented with a large rubber ducky with autographs and personal messages of gratitude from each team member. Rosati had actually presented this same duck to the athletes the year before. They thought it would be fun to sign it, emblazon its side with the Athlete Oath, wrap it all up with a Unified gold medal and then present it back to her. She was very touched. “Overall, it has been a very positive event for the athletes to be involved in. Their fundraising techniques get better with each passing year as their rising goals can attest to,” Brescher said. Click here to adopt a duck from the Darling Ducklings team.